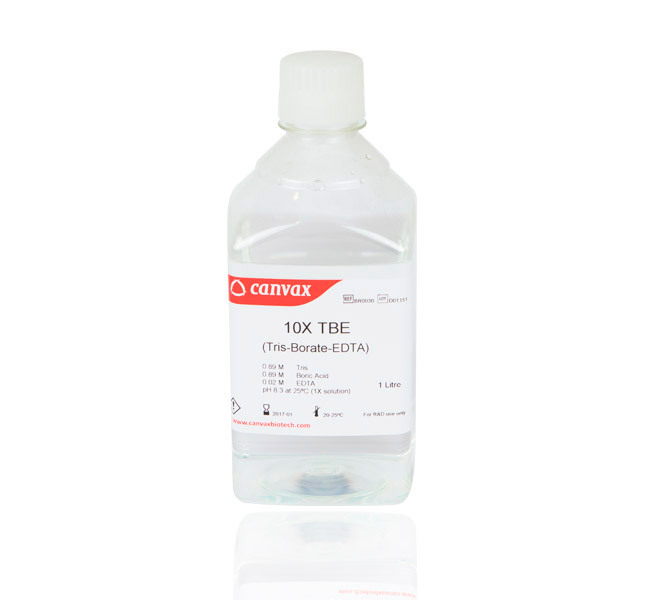 TBE is a high quality, reliable and convenient buffer for DNA and RNA polyacrilamide gel electrophoresis. It is useful due its basic pH, which allows migrations of DNA through the gel toward the positive anode. TBE buffers are used for the analyses of DNA products resulting from PCR amplification, DNA purification, or DNA cloning experiments. TBE has high resolution for separating smaller DNA fragments but it is complicated recovery DNA from gel. If you are interested in a different ph Formulation, specifications, Size or Concentration, please Contact us, we will offer this Product to you at the same price than Stocked Products from 1st unit. Reliable: stringent quality control standards to guarantee lot-lot consistency. High Quality: free of DNase, RNase or protease activities. Time-saving due its ready-to- use format that avoids experiment preparation time. High purity of components used. Running buffer and gels for RNA analysis native and denaturing. Transfer buffer in Northern Blotting. Free of DNase, RNase or protease activities, guaranteed by appropriate quality tests. Recommendations: Store the product in a dry place.